He went on to front Black Sabbath, replacing original lead singer Ozzy Osbourne, releasing the frighteningly good album Heaven and Hell and The Mob Rules. The latter album’s lineup of Dio, Tony Iommi, Geezer Butler, and Vinny Appice came together in 2006 to form Heaven & Hell. Some of Dio’s finest work was with his own band, Dio. Its debut album, Holy Diver, is one of the greatest albums of all time. Its title track, with the relentlessly marching guitar riff and voraciously powerful vocal, will always be regarded as one of the best examples of metal music. 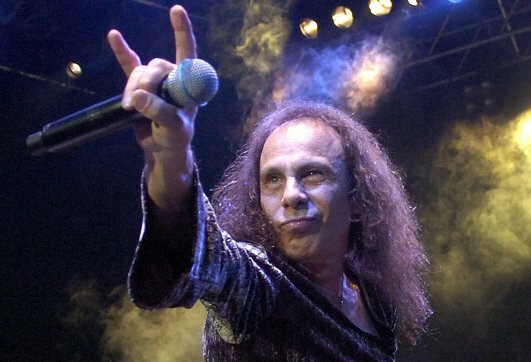 In late 2009, Dio was diagnosed with stomach cancer. Despite treatment and signs of improvement, Dio’s condition quickly worsened. He passed away May 16, 2010 at aged 67. As soon as the tragic news was announced of his passing, tributes immediately began to pour in from all corners of the metal world [See Geeks of Doom’s own “Horns” tribute]. All of them highlighted that Dio was not only a truly great singer, but also a wonderful human being to those who knew him or were lucky enough to have met him. His colleagues knew this to be true and so too did his fans. “He possessed one of the greatest voices in all of heavy metal, and had a heart to match it.” – Twisted Sister guitarist Jay Jay French.